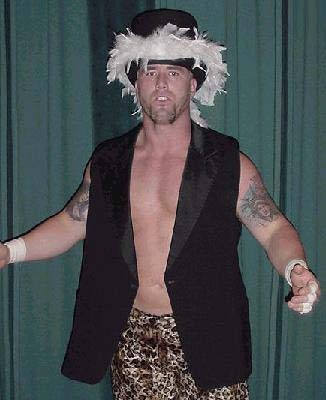 Rodney was a member of the Mean Street Posse with Pete Gas and Joey Abs, who were childhood friends of Shane McMahon. May 3, 1999 – RAW: Gerald Brisco & Pat Patterson defeated The Mean Street Posse (Rodney & Pete Gas) by Count-out..
May 10, 1999 – RAW: Gerald Brisco & Pat Patterson defeated The Mean Street Posse (Rodney & Pete Gas)..
July 5, 1999 RAW: Test defeated Joey Abs by DQ when Rodney & Pete Gas interfered..
~~~Stephanie McMahon ran down but Shane held her back and forced her to watch Test get beat up..
August 2, 1999 RAW: Shane McMahon told Test to stay away from his little sister Stephanie..
~~~Test came out and said he’d go through the Mean Street Posse to get to Shane McMahon..
September 13, 1999 RAW: Test defeated Joey Abs (w/Pete Gas & Rodney) in a Grudge match. October 21, 1999 – Smackdown! : Test, Edge & Christian defeated The British Bulldog & The Mean Street Posse in a 3vs4 handicap match. October 31, 1999 – Heat: Pete Gas, Rodney & Joey Abs defeated The Headbangers. December 5, 1999 – Heat: The Acolytes vs Pete Gas, Rodney & Joey Abs ended in a no contest. December 13, 1999 – RAW: The Acolytes defeated The Mean Street Posse in a 3vs2 handicap match. December 16, 1999 – Smackdown! : The Acolytes defeated The Mean Street Posse in a 3vs2 handicap match. December 20, 1999 – RAW: Too Cool & Rikishi defeated The Mean Street Posse. December 23, 1999 – Smackdown! : Christian & Matt Hardy defeated Pete Gas & Rodney. January 6, 2000 – Smackdown! : Taka Michinoku & Sho Funaki defeated Pete Gas & Rodney. January 15, 2000 WWF Jakked: Jack Black & Jerry Miller & BJ Payne defeated The Mean Street Posse. January 16, 2000 – Heat: Too Cool & Rikishi defeated The Mean Street Posse. January 27, 2000 – Smackdown! : Tazz defeated The Mean Street Posse in a 3vs1 handicap match. February 6, 2000 – Heat: Too Cool defeated Rodney and Joey Abs. March 5, 2000 – Heat: Sho Funaki defeated The Mean Street Posse in a 3 vs 1 handicap match. March 23, 2000 – Smackdown! : The Big Show defeated The Mean Street Posse in a 3 vs 1 handicap match. March 25, 2000 – Jakked: The Headbangers defeated Joey Abs & Rodney. April 8, 2000 – Jakked: The Godfather and D-Lo Brown defeated Joey Abs and Rodney. April 29, 2000 – Jakked: The Headbangers defeated Joey Abs and Rodney. July 2, 2000 – Heat: D-Lo Brown & Chaz defeated Rodney & Pete Gas. July 22, 2000 – Jakked: Trasher defeated Rodney. August 5, 2000 – Jakked: Too Cool defeated Pete Gas and Rodney. August 19, 2000 – Jakked: D-Lo Brown and Chaz defeated Pete Gas and Rodney.